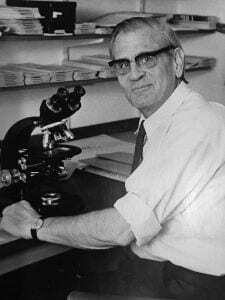 Brain tissue samples from people with epilepsy who died and had a post-mortem examination were systematically studied by an eminent neuropathologist, Professor John Corsellis between 1950 and 1997. He published important studies based on what became known as the ‘Corsellis collection’, one of the foremost and largest brain tissue banks. His epilepsy publications remain highly regarded and relevant to this day including seminal works on temporal lobe epilepsy and the brain alterations following uncontrolled epilepsy (status epilepticus). UCL have recently acquired this historical tissue archive of epilepsy cases. Professor Thom’s aim is to restore, re-examine and catalogue the Corsellis epilepsy collection for use in modern research. This collection is valuable as epilepsy post-mortem tissue samples are becoming scarce due to medical advances and changing attitudes. Furthermore, the archive was collected from people with epilepsy alive from the 19th and 20th centuries, many with poorly controlled seizures, before effective medical and surgical treatments were available. Up to date pathology and genetic methods can now be applied to re-examine and re-classify these cases to compare with modern surgical series. Over a two year period, Professor Thom and colleagues plan to restore this tissue collection, publish their findings and make this archive available to researchers. This collection will be known as the Epilepsy Research UK Corsellis Brain Collection.